Bithynia, Dia. 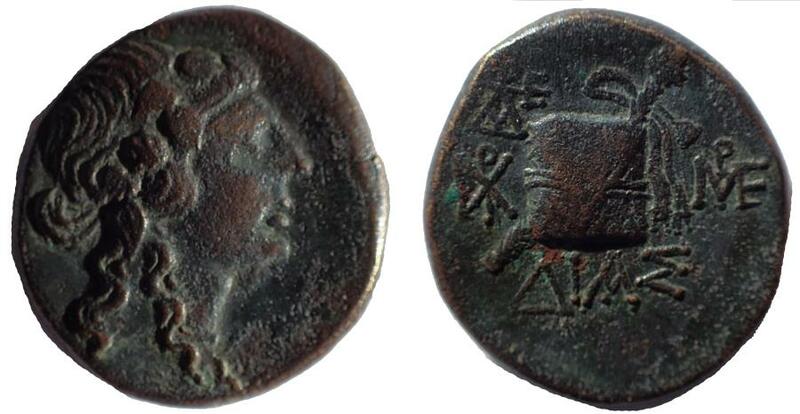 Time of Mithradates VI Eupator (Circa 100-95 or 90-80 BC). Ae 20. Rare. Bithynia, Dia. Time of Mithradates VI Eupator (Circa 100-95 or 90-80 BC). Ae 20 mm. 8.4 gm. Obv: Head of Dionysos right, wearing ivy wreath. Rev: ΔΙΑΣ. Cista mystica and filleted thyrsos; two monograms to left, monogram to right. SNG BM Black Sea 1559 var. (monogram to right); GC 7, 452. Rare. Greek, ca. 5th to 4th Century BC. Bronze spout in the form of a slave, Very Rare.